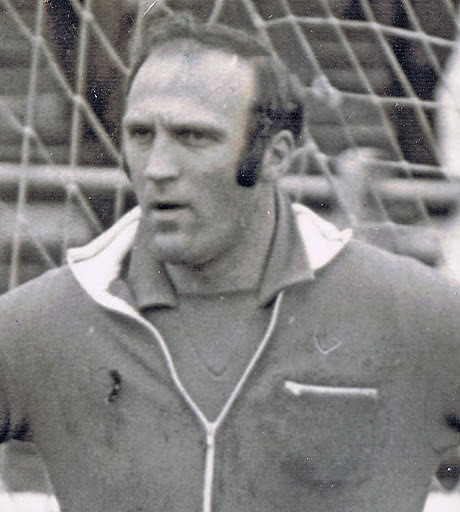 Allan Ball has played more games for Queen of the South than any other player in the club’s history. In a career at Queens lasting from the early 60s to the early 80s, Ball played in goals for Queens’ first team on 819 occasions (731 games were league and cup, the rest were challenge games and testimonials). As well as being a key member of the promotion-winning team of 1981, Ball also enjoyed many great personal moments in a career with Queens that continued well beyond the day he hung up his gloves. Allan Ball contributed to this article with an interview in December 2008. “I started out as an inside forward, playing at school and gaining representative honours. I actually went in goal when Jimmy Montgomery who played for Sunderland got hurt and I went and played in goal instead of him. When I went back to school they said, ‘Well that’s where you are playing from now on’. I was signed with Burnley at the time as an inside forward as a school boy, but, I’ve never regretted it, it was a tremendous transformation. Jimmy didn’t get back in the team after that but to be fair his arm was injured so I suppose if he had been fit it would never have happened, so he did me a good turn”. “Ralphy Coates went and played for Tottenham and England. Ralphy and I went to school together. There was a lad called John Sproates who played for Sunderland as well. A lot of players that were fantastic at 15 year old, they disappeared. There’s only 1 or 2 out of the team that continued to play. They were all signed by league teams but there’s not a lot made the grade unfortunately. On himself, Ball articulated the next step in his career. Joining in season 1963/64, Ball’s first manager at Queens was ex Scotland international George Farm, a player for who Ball clearly had a great deal of respect. If the result on Ball’s debut wasn’t what he had hoped for, two weeks later was the small matter of an away league match against Celtic. Ball though again earned praise for his endeavours despite a 2-0 win for the homesters. Three of Ball’s most memorable performances came in cup games in season 1975/76. First was a League Cup quarter final game against Rangers with the first leg at Ibrox. There was also the Scottish Cup Fourth Round ties against Ayr United in February 1976. The Ayr team had been assembled by a manager whose star was very much in the ascent, Ally McLeod. McLeod had left the previous November for Aberdeen en route to becoming Scotland manager. Now managed by Alex Stuart, the Ayr team McLeod left that season finished sixth in the Scottish top tier; their fourth straight season finishing no lower than seventh. John Murphy, Alex Ingram, Alex McAnespie and Rikki Fleming are all Ayr United Hall of Famers. 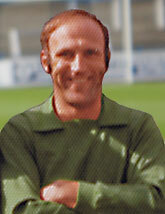 Johnny Doyle left the month after the QoS cup ties to become a Scotland internationalist at Celtic. They and other Ayr greats all played against Queens in this cup tie. “I’ll never forget it; I played that first game up at Ayr. We were 2 – 0 down and I got an injury. I just thought it was a wee ankle strain. At half time we went off and Jimmy Anderson, the trainer, was taking my boot off to have a look at the ankle. The chairman was there and he said to the trainer, ‘What are you doing?’ and the trainer said, ‘I’m taking his boot off to take a look’. The chairman said, ‘Don’t take his boot off or you’ll not get it back on. He’ll not be able to go back out’. The doctor looked at it and he says, ‘I think it’s broken’. I said to them, ‘Just strap it up, just strap it up’, so they strapped it up. I got some pain killers and it was fine for 10 minutes, 15 minutes, then it started to wear off and I was hobbling about. We equalised, 2-2, then they got a penalty with eight minutes to go. I always remember Johnny Graham took the kick. Hobbling about, I could only go one way. I went to go left as if I was going to go that way and then I went right. It made it look a fantastic save, but I could only go right. Their player should have been flogged because if he put it left I just couldn’t put any weight on it. So we drew 2-2 and the replay we won 5-4. I was sitting in the dug-out with crutches [Graham McLean deputised in goal making two magnificent saves just before the end of 90 minutes to take the game to extra time]. The game was the best I’ve ever watched except the Aberdeen semi final. 5-4, Peter Dickson, fantastic. Nine goals, end to end stuff, it was a fantastic game. People always talk about it at dinners, it was a fantastic occasion. During his career Allan Ball picked up a solitary booking when he was cautioned by referee Tiny Wharton for incredulously of all reasons - blaspheming in a game at Christmas. “The first one was against Carlisle, it was great, I thought thanks very much to the club. I’d never have thought for one moment I’d still be playing another 10 years later. Then for the second one, it was against Man City. It was originally going to be Celtic. Billy McNeil and I are very good friends, we spoke and he said he’d bring a Celtic team down but he moved to Man City. I spoke to him and he said, ‘As soon as the fixtures come out and we play Newcastle on the Saturday, we’ll come up and stay the Saturday night and play the testimonial on the Sunday’, and it happened in the September. It was a fantastic occasion but it was a hell of a day for me to cope with because it was really the end for me." 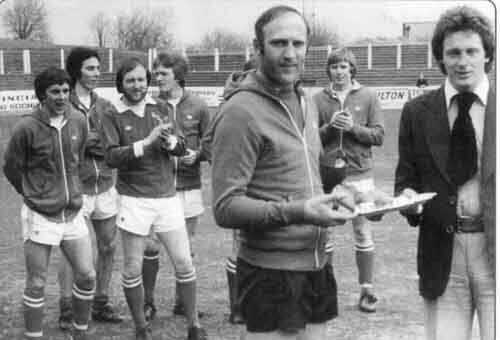 (Allan Ball at his second testimonial game. Back row - Muir, Cloy, McMinn, Davidson, Cochrane, Parker, Hamilton, G Robertson. "The first half I played in it, I knew it was the end - the balls were flying like bullets and the reactions just weren’t there. It was a fantastic feeling though, there were some great players there. Danny McGrain who is still a good friend, and the Tin Man. Danny McGrain made Ted McMinn that day, telling him what to do. And a few weeks later Ted signed for Rangers and went on to do very, very well.” Others guesting for Queens that day were Davie Cooper of Rangers, Gary Mackay of Hearts and Ball’s ex Queens team mate Rowan Alexander, then of Morton." I went down to Gretna. I was actually going to sign for Bishop Auckland in the Northern League, one of my first teams 20 odd years before that. I actually went down and played for Bishop in a pre season friendly against Gretna. I basically agreed I would sign for Bishop. The next morning the phone rings and it was the chairman of Gretna, Keith Rhodes, who I’d never heard of. He said, ‘Can we come and speak to you?’ I said out of courtesy, ‘Yeah but I’ve got a contract in my pocket to sign.’ Anyway, he came over and he just blew me away. At my age 40, coming 41 they offered me a fantastic deal and it was handier for home and I signed for them. The second game of the season was Bishop Auckland away and we beat them 1-0, again under pressure. I had a good game and I was quite chuffed. My family wasn’t too keen because they would have seen me more if I was down there playing for Bishop, I would have been down there practically every second week but I never regret going to Gretna, it was a good little club. I was there a season and a half. I always said I would pack in football when I didn’t enjoy training. “I still miss it. I still sit in the stand thinking I’m the best goalkeeper. In fact I’m the best centre forward. It never dies away from you. I still think I can play but at 65 it’s not the case now. "Last night Queen of the South created a new position when former goalkeeper Allan Ball was made Honorary Director”. “I remember going to Forfar for the winning game of the Second Division in 2002, that was fantastic, that was a highlight of my whole time with Queens, watching them win the division, something I never achieved, even though I played in the ’81 promotion team. It was nice to get back up a division. And the Challenge Cup Final [in autumn of the same calendar year]. “Then of course the last eight months, nine months. When we played Dundee in the quarter final of the Cup at Palmerston, a full house, and beat them 2-0. I thought that’s it, we won’t repeat that. Then we were drawn against Aberdeen in the semi final at Hampden. The town was going mental. We went up there, we sold out 9500 tickets, and of course the result, winning 4-3, I’ll be honest with you, I thought I was having a heart attack when the assistant put up 4 minutes injury time, I thought I can’t believe this, but we went on to win 4-3. That was really every body thinking that was our cup final. Playing Rangers in the final, to be fair I don’t think we turned up in the first half. Rangers were complaining about playing too many games, we hadn’t played for four weeks and I think we lacked a little bit. But when we come out in the second half, and 15 minutes later 2-2, I thought we were going to go on and win, I really did. I spoke with Walter Smith after the game and he said, ‘The last thing I said to my players at half time, “go out, weather the storm for the first 15 or 20 minutes because they’ll come at you, and you’ll go on and win by 5 or 6.“’ He then said to me, ‘At 2-2 I really thought that we would get beat, you deserved something out of the game. Our supporters, Rangers supporters, applauded you throughout the game and at the end of the game and you don’t often see that. Fantastic. As a Queen of the South man you should be proud of yourself’, which I am”. 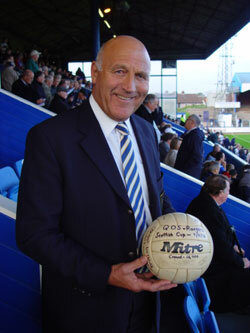 Allan Ball was announced on qosfc.com as having passed away on 21 July 2018 after a lengthy illness. He was 75. His passing was reported in media outlets as far as afield as Africa and America. He is survived by his wife Olive, his son Keith, daughter in law Alison and wider family.